Soul Mates. 25" x 31". 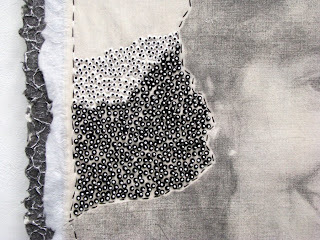 Hand embroidery and beading on a xylene transfer on tea-stained muslin. 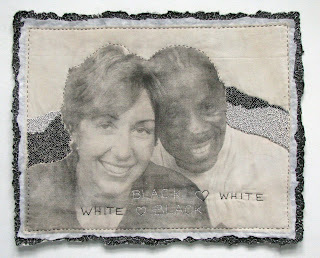 Stitched word (twice): Black ♥ White. I am truly thrilled with this new piece in my Decision Portraits series. I've known this couple for years....before either of their two beautiful daughters were born. "Soul Mates" says it all. I've even submitted this one for an exhibition. The odds are very, very long; I don't have much hope for its acceptance, but I had to try because the piece is so positive in every meaningful way. It is also posted on my Decision Portraits blog.....along with my "wish list" for future pieces. I've already started on Poet. I see in your blog you have been experimenting with solvent transfers. I have use acetone with fairly successful results. Although one does have to work fast and pay attention to how much solvent is applied.